This Christmas, Jesus is being raped in a United States concentration camp. His parents came to the Untied States’ southern border, seeking asylum as protected by US and international law. They were captured, their child taken from them, and they were locked in cages in separate concentration camps. Presently in that concentration camp, held in cages with 15,000 other children taken from their parents, Jesus is being sexually abused by concentration camp staff. Mary and Joseph, panicked and sobbing and despairing of ever seeing their child again, are locked in cages a thousand miles away. There is no plan to release them, and there is no plan to reunite them with their traumatized son. He was taken as a baby, and does not speak English, and there are no careful records being kept, so it is unlikely he will ever see his parents again. This. Is. Who. We. Are. Now. If you take the Bible seriously, then this is the conclusion you must come to. Why? 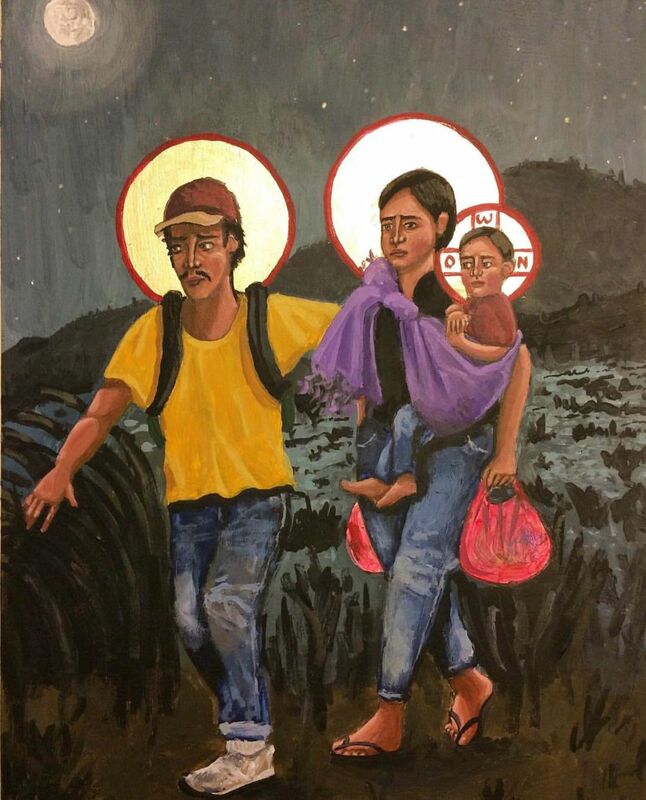 For the first reason, which is that the Holy Family fled to Egypt seeking asylum when their lives were in danger, and for the second reason, which is that Jesus says very clearly that how we treat the least among us is how we treat him. There are complex interpretive challenges when reading the Bible, but this is not one of them. This one is simple. As I write this, filled with rage and disgust that has grown beyond words, I find that I have nothing else to say. Tonight our hamster died, so I decided to tell a story about prayer. When we first got our hamster, Zu-zu, my daughter was so excited. She was 6 at the time (now 7) and was just enamored with this little creature. We had seen her at the pet store that afternoon and gotten her on an impulse, as we tend to do. We go to the pet store because it cheers us up, and is something we can do for free, but sometimes we come home with a creature. Not long after, Zu-zu escaped her cage in my daughter’s room right around bedtime (Zu-zu turned out to be an elite escape artist). We went through the entire upstairs part of our house, but to no avail – the hamster was nowhere to be found. My daughter was really upset at the loss of her new pet. Eventually, hours after bedtime, she fell asleep, still tearful. I felt a lot of sympathy, and also had my own situation to feel bad about – I had stood up two wonderful women from my church with whom I had a lunch date. I tried all I could think of to contact the two of them and apologize, and try to find a way to make amends, but they weren’t responding. I felt miserable about it because these were two genuinely good people whom I had just failed. They were the kind of people who would be really hurt by this kind of thing, as well. That night, upset on my daughter’s behalf, and on my own behalf, I prayed. Now, I have a well-documented ambivalence with regard to prayer. Suffering from depression and anxiety, I’d been told many times that I could just pray these things away. They were all in my mind, after all. If it wasn’t working, it was because I was a failure – not faithful enough, secretly evil, too full of doubt, whatever. And working in a hospital as a chaplain, I had seen plenty of good people pray and still suffer for no discernible moral or theological reason. Balance that with the many stories of answered prayers I’ve heard as a pastor and a Christian in general, as well as the painful stories of unanswered prayers. But, anyway, I prayed. I prayed that we would find Zu-zu, and that my two friends from church would forgive me. I didn’t know what else to do, and even I pray when I’m desperate. That night, my daughter had a dream. She woke my spouse and I up to tell us about it. In her dream, she found Zu-zu in her room, standing on her hind legs and cleaning her face and smiling at her. So I thought, OK. I went into her room, looked around for a while by the light of my cellphone, and there was Zu-zu, standing on her hind legs, cleaning her face with her little paws. The next day, my two friends let me know that they forgave me, and we made new lunch plans. Prayer is weird and doesn’t make any sense. When put to a rigorous test, it tends to fail, yet billions of people believe in its efficacy. I wrote a whole book about not praying, but there it is. I prayed, and that’s what happened. I remember the flood of thankfulness that I felt, the wonder that things had turned out OK after all. And my 6 year old having a predictive dream about finding her hamster – that was genuinely weird. Yes, sure, she could have just seen her hamster while half-asleep, thought she dreamed what she had, and told us about it. The hamster was in the dark and behind a dresser, but sure. That’s what could have happened. And my two friends might have just chosen that day to let me know that they forgave me. Just a coincidence. Prayer is like that. It’s frustrating. What is “Biblical” at the Border? Here’s what I wrote for the church newsletter on the topic of what would be “Biblical” at our southern border. If you suddenly see a lot more blog posts in the near future, it’s because they ran me out on a rail, as my church includes plenty of Trump voters. We’ll see. In our ongoing national argument over our borders and how to maintain them, there is a periodic claim on one side or another that a particular view is “Biblical.” This is often confusing or frustrating for me, because the Bible is a library, and contains dozens of different voices that we know about, spanning at least 1500 years of texts. To simplify a claim down to “Biblical” or “not Biblical” is possible, but difficult, and requires a lot more work than pop culture and cable news programs allow. More work, in fact, than this Perspective article allows, but I wanted to say something – to put my own thoughts in the mix, so to speak. Jesus’ ministry and the ministry of those who followed after him included a great deal of boundary-crossing. He crossed geographical boundaries and social boundaries as well, naming enemies as neighbors worthy of giving and receiving love, and listening to those who were silenced by the people around them. At the same time, the Hebrew scriptures in particular have a lot to say about boundaries, borders, and their maintenance. In particular throughout Joshua, with references in Exodus and Proverbs and Ezekiel, there is the idea of the Promised Land, a land in which, within certain borders, God’s chosen people would be able to flourish. I don’t want to focus on the boundaries themselves, however. In the Bible there are a number of texts, especially in the Hebrew scriptures, that seem to say that God ordains and draws boundaries for the various peoples of the time. On the other hand, the Hebrew scriptures and New Testament have a large number of passages calling on people to cross boundaries and knock down walls – sometimes literal walls, usually metaphorical ones. One very consistent message of the Bible, however, from cover to cover, is how we are to treat people who cross our borders. These are just the briefest sampling of dozens of passages that have the same message, over and over again. We called to treat ger, sojourners, as we would treat a neighbor, with compassion. The most common reasons given for this call is either that God’s people are sojourners in this world, and have been from the very beginning (Adam and Eve were driven out of their homeland to wander; Abraham wandered; Moses wandered), or that God’s nature is to call sojourners, and watch over them, and when necessary execute justice on their behalf. Frequently the command to respect and care for ger, for sojourners, simply ends with the reminder: I am the Lord your God. In the Gospels, we have Jesus’s insistence that however we treat the least among us is how we treat him, and that we will be judged based on that treatment. In recent weeks it has been widely reported that thousands of children have been taken from their parents and placed in camps, prisons, and other places like abandoned office buildings. These children range from less than a year old to adolescence, and include children of asylum-seekers who entered our country legally, and others who entered our country illegally (which is a misdemeanor). This policy of family separation is expressly undertaken as a punishment, and there is clearly no sufficient plan in place to reunite these children with their families. In many cases, there is no record or paper trail for these families, and the children have been relocated multiple states away. (One local example: dozens of asylum-seeking fathers, who entered the country legally, are currently incarcerated with their children in Berks County, PA, and have been for a few years now). These children, including infants and toddlers, will now need to go to court alone, without any family, while immigration courts try to determine their status and, we hope, seek to reunite them with their families when this policy ends. Even that will be a monumental task, given the lack of care and documentation. There is no question that some of these families will have lost their children forever, which is an unimaginable heartbreak. There is also no question that some of these children have been trafficked, abused, and mistreated. I know that among those of you who read this perspective of mine, there will be some who disagree with me about immigration, and refugees, and asylum-seekers, and others who agree, and some in-between. I hope that we can agree, however, that not only is this policy of family separation inhumane, it is also entirely against the message we find in scripture as to how we should treat sojourners. We are forgetting that our ancestors in faith were refugees and asylum-seekers, who crossed borders seeking safety; we are forgetting that our Lord and Savior and his family crossed borders seeking asylum when he was a small child. We certainly don’t have to abolish borders, or make them un-secure, in order to treat people humanely. I don’t have anything left in the tank, so here is what I wrote for the church newsletter. The final count seems to be 14 wounded, 5 of whom suffered life-threatening injuries, and 17 dead. This is, according to Everytown for Gun Safety’s records, the 18th school shooting so far in 2018, and the 8th school shooting to result in fatalities. (1) As I write this, it is only February 15th, so by the time you read this Perspective article, that number of school shootings will already be higher. Every 2 or 3 days, on average, we can expect another school shooting, and every 5 days or so, a school shooting in which children and educators are killed. I have long since lost track. I am not even able to grieve these shootings, because they happen so often and so relentlessly. And each time, there are tears, and questions, and “thoughts and prayers”, but no change. The school safety industry is now a nearly 3 Billion dollar one, as companies scramble to develop curricula and training programs around mass shootings. We can no longer, I think, act surprised when these shootings happen. School shootings are now a normal part of life in the United States. All over the country, in elementary and middle and high schools and colleges, kids are going through regular training in how to respond to an active shooter. All the way from Poppy in kindergarten in Royersford to my friend Carol’s daughter in high school in North Carolina, children are training in how to survive a mass shooting. I wish I had hope that our situation would improve in this country, but I think back to the Sandy Hook shooting in 2012, where 20 children were killed, along with 6 teachers who died protecting them. At the time, a British journalist reflecting on our lack of response wrote the following: “In retrospect, Sandy Hook marked the end of the U.S. gun control debate. Once America decided killing children was bearable, it was over.” We decided, in particular our political leaders decided, that we would rather endure the deaths of hundreds of children than change our relationship to guns. Since Sandy Hook, more than 400 people have been shot in more than 200 school shootings. I know that a pastor taking up this issue for a newsletter article is a risk. It seems risky to bring up gun control and gun violence in the United States. But on the other hand, we are not having a gun control debate. We are not having a gun violence discussion. We have decided. The research on gun violence is compelling, and it is summed up in a November 7, 2017 article in the New York Times titled “What Explains U.S. Mass Shootings? International Comparisons Suggest An Answer.” The article is available online if you’d like to read it, but the shortened version is that mental health has no correlation to gun violence (actually, a negative correlation). Video games and other media have no correlation to gun violence. The racial makeup of a nation, whether it is homogeneous or diverse, has no correlation to gun violence. The rate of non-violent crimes has no correlation to gun violence. The only thing that correlates to gun violence, worldwide, is how many guns are in a society, and how easy it is to get them. Switzerland is a country where an above-average number of people own guns, but it is much more difficult to become a gun owner there than in the United States. Yemen is the only country on earth with anywhere near our number of guns per capita, and our ease of ownership, and they have a comparable problem with gun violence. (And we must remember that Yemen is in the midst of a man-made humanitarian disaster and civil war) We are a society with over 270 Million firearms, and we have the fewest restrictions on gun ownership of any country on Earth. And we are the only country on Earth that has the mass shooting problem we are seeing, and the only country on Earth with the school shooting problem we are seeing. In fact, our gun homicide rate is 50 times higher than countries with comparable wealth and standards of living. Other countries have mental health issues, and violent video games, and violent media, and ethnic diversity, and crime, even at higher levels than we do. But none of them have the relationship to guns that we do. I would call that relationship, if I’m being honest, an idolatrous devotion to guns. The passage from Luke that I quoted above is Jesus at his most warlike in all of the Gospels. This is the most approval Jesus ever gives for carrying or using any weapon. Every other time Jesus mentions a weapon, it is clearly metaphorical, but this time, he seems almost literal when he says ‘sell your cloak and buy a sword.’ There are three problems with seeing this passage as Jesus approving of owning weapons, however. The third problem is that, if Jesus really is promoting weapon ownership among his followers, it is in direct contradiction to everything else he has taught and done throughout his entire ministry. When Simon-Peter wields one of these butcher knives to wound a servant of the Temple, Jesus immediately rebukes Simon-Peter, and heals his enemy. That single wound is the entirety of Jesus’s followers’ violence and use of weapons. So, my reading of this passage is actually that Jesus is speaking of swords metaphorically, the way he has done in other passages. A couple of his followers take what he says literally, holding up butcher knives as if they are part of some great army, and Jesus says “That’s enough!” Did Jesus think that two butcher knives were enough to overthrow the Roman Empire? I doubt it. He was also mindful of prophecy, and I believe this is an instance where he is doing and saying things so that they fulfill prophecies that referred to him, and would tell people what would happen (though seemingly none of them quite understood). What I’m left with, for us, is the question: when will we have had enough? Sandy Hook wasn’t enough. The 200 school shootings since Sandy Hook have not been enough. The 400 deaths in those school shootings have not been enough. I doubt this most recent shooting in Florida will be enough, and I doubt the next shooting that will inevitably follow will be enough. We will get “thoughts and prayers”, and partisan bickering, and then a few days later, the next school shooting will happen. Jesus hit his limit when two of his disciples pulled out butcher knives, and the moment someone actually used one of those butcher knives on another human being, Jesus rebuked the wielder and healed the enemy. If he is our example for what our relationship to weapons should be, where does that leave us? At the beginning of Lent, traditionally a season of repentance, I think this is a good question with which to begin. (1) Some people see the number 18 as inaccurate, and don’t agree with how Everytown defines “school shooting” as any time a weapon is discharged on school property, so I included the count of 8 that included fatalities. This is an image I have heard innumerable times: You have died. You are greeted by an angel, and told that you will be shown your life. You are seated in a movie theater, and are shown your entire life, from birth – every good and bad thing you ever did. Every secret thing, including every secret thought. Maybe the other people in your life are there too, in the movie theater, watching. The idea is that you will be horrified, and humiliated, and embarrassed. You will feel intense shame and guilt for all you have ever done. You will understand how awful you truly are, in that moment – how unworthy and utterly in need of salvation you are, miserable worm. Then you are judged based on what the movie showed. If you died without Jesus in your life, you are sentenced to Hell, and in this imaginary situation, it is well-deserved. You nod your head, tearful, understanding God’s transcendent justice in sentencing you to an eternity of torment. The above is a horrifying view of the atonement. It is an expression of one of the worst threads of Christian theology – the idea that shaming and guilt-tripping, teaching people how awful and irredeemable they are, is the best way to bring them to God. As an inheritor of the Reformation, on the 500th anniversary of Luther’s 95 Theses, I realize that this criticism is squarely pointed at my own tradition, such as it is. Luther and Calvin and many who came after went to great lengths to describe what miserable worms we all are. The basic message is that the at-one-ment with God is achieved because God pinches His Divine Nose and grudgingly accepts your miserable soul, solely because he was first able to contrive a situation where his own self could be tortured to death on a cross as compensation for the whole affair. What if God Isn’t a Vindictive Jerk? When I think about being in the audience in this humiliating theater, watching someone singled out and shamed by a bullying God, I feel deep sympathy. What a horrible situation to be in. Anyone who has ever been mocked, or bullied, or singled out for abuse, or humiliated can surely empathize with this situation. I was recently listening to a sermon that described just this scene, the one referenced in the pages from a Chick tract above. I felt not only sympathy for the person afflicted by this view of God, but anger at the God who would do this. This would be despicable behavior from a human being – from God it is categorically irredemptive. Imagine, rather than the terror of being truly known by God and others that haunts some of us (maybe many of us? ), there was a similar scene. You are lovingly invited to a theater where your life is shown on the screen – in all of its mess and beauty, loss and triumph. It is the great story told by your time in the world, with all the laughs and cheers and tears and even regret. And through it all, there is the loving presence of those who love you, of a God who loves you, who see you for who you are and love all of you. What you went through life fearing, and protecting yourself from, happens, and it is a time of joy and radical acceptance. You are where you are meant to be, and you are who you were meant to be all along. One might even go so far as to call that atonement. Yes, this is a fantasy hearbreaker. A Tolkien-esque one no less! Until Cubicle 7 put out The One Ring, I was working on a system that actually reflected Middle-Earth. When TOR came out, I really felt that they did a good job at my task, so I let it languish. The system as it is still has some interesting things about it. I wrote a post about attribute decay, for example, that is part of SotSF, and there are other elements in there that I like. But, an obvious problem: I do not work for Cubicle 7, which currently has the right to publish a RPG based on Middle-Earth. So whatever I do to complete this project would just be for me, for groups I game with, or maybe to release out into the world for free. Years ago – eight years ago now? – before 5th edition existed for D&D, I hacked 4th Edition in order to run a game for a group that wanted to play D&D but wasn’t interested in learning a lot of rules. Or, in some cases, any rules. Though that hack was designed with 4th Ed in mind, I could definitely adapt it to 5th Ed. It’s even something I’m still interested in playing and running. One of my problems is that I am interested in too many things. Scattered. But one thing I’m interested in is rewilding, and more than that, the idea that for the most part our civilization is not a good idea, certainly not in the long term, and that some other way of life is probably the way to go. There are plenty of other people who know a lot more about this, who are working to learn self-sufficiency, and becoming ungovernable, and training in prehistoric survival skills. I’m not very good at any of these things, yet. I have noticed, though, that I know more about the Bible than other people who are interested in rewilding. What I would like to do is to create a resource, probably the length of a short book, that looks at passages in the Bible that reflect this worldview. There is actually plenty there. And based on the reception of a recent sermon, I think there are people who might be able to hear what I have to say. A few years ago, two friends of mine and I assembled 95 Tweets, our homage to Luther’s 95 theses, all arguing against the idea of a Hell of eternal conscious torment. Even from a purely Christian standpoint, even from a literalist, the arguments for Hell are incredibly week, and the counter-arguments kind of overwhelming. So we overwhelmed, with 95 tweets. The problem is that, with a barrage like that, there’s no point at which to engage. Even if someone wanted to argue a contrary position (and I know many do) it’s hard to get a hand-hold. So, I feel like I need to expand the ideas and claims that we made in the 95 Tweets. Part of what makes me hesitant is that there is already a lot out there about this issue, and I need to make sure that what I would contribute would be worthwhile, and not just replicating someone else’s work. I started a D&D 5E game set in what I’m not calling Tianxia, but that was just called Dragonblade at the time. It’s a south and east Asian mashup in the way that a lot of fantasy settings are a north and western Europe mashup, primarily drawing on Japanese, Chinese and Indian history and mythology. It’s fun, and I’ve posted a bit of my work on this blog before. It’s also the result of my frustrations with other attempts to do the same thing. Does that make it a hearbreaker? Sort of. Oh well. I think it’s a cool setting, and I’ve run the first part of a game in it. My rule is that I design settings that I would be excited to play in, and this one fits the bill. I recently completed a long-term campaign called Twilight of the Gods. The setting is mythic Scandinavia, and beyond that, Europe and the wider world. The setting takes Ragnarok literally, and a campaign set in it will begin when Ragnarok is just about to. The advantage here is that the setting is actually slightly simpler than the base setting for 5th Edition. I’ve also already put in a lot of the work already, having run a full campaign. This is a cool setting that I’ve sketched out, but in which I have yet to run a campaign. It is inspired by the stories of 1001 Arabian Nights as well as aspects of Islamic mythology, blended with Dungeons & Dragons of course. It has a monotheistic religion, and godlike genies ruling a realm of raw and exaggerated elements, and other coolness. Less developed than Dragonblade or Twilight of the Gods, but still really cool. I’ve been blogging since 2006, and have carried over two other incarnations of my blog to this site. So, if you want, there are 11 years of my writing to choose from. Can’t recommend it all, though. I’ve been working to be more consistent in writing, and I’ve found some cool connections on Reddit, as well as continued connections through social media. I’m trying to build up weekly, ideally daily, writing discipline. I’m not there yet, but it’s a vehicle for sharpening my skills. It always has been.